My earliest memories are of my father jumping up and down and yelling and laughing at the TV during the World Cup. It was an event that every four years turned a quiet joyful man into the most expressive human being on the planet. I loved it. Soccer has been such a big part of our families traditions that it really was the place where my father and I would connect no matter where we were in our relationship. Without a doubt I knew that no matter where I was as soon as the World Cup would start, which usually coincides with Father' Day, I would block out the next month and we would find a way to watch as many games as possible together. Without a doubt I knew that no matter where I was as soon as the World Cup would start, which usually coincides with Father' Day, I would block out the next month and we would find a way to watch as many games as possible together. My father's history with soccer is rich and full. He played as young kid and all the way up into his adulthood. You can tell by the way he paid attention to every detail about the game it was a dream that he still thought about every moment he could. Like many in El Salvador their dreams and plans all took a back seat when the war started. He took the initiative to find a better life for him and his family and decided, through the way of Mexico, to come to America. I often wonder how tough that decision was to make. To leave everything you know, your friends, brothers, sisters, and parents so that your kids could have a better life. It's a fear and choice that I never will experience in my life. And for that I am forever grateful. His passion for soccer never dwindled, it just grew stronger. I remember when the World Cup games had ended for the day, we would go out to the front yard and he would help me practice being goalie in between our two maple trees in our front yard, in College Place, Washington, which were perfect planted as if they purposely meant to be two goal posts. We would spend hours out there and he would talk about what I could do better and also break down the games from earlier in the day. Mom would be making food and we would go in after and eat while watching the highlights. It truly was an event that took over our lives for the Summer. As the years went on we kept watching the games every World Cup, and then life takes its course and I eventually got married to my amazing wife Kaitlyn. She had yet to experience this cultural event with my family and boy was she in for an event of a life time! The week before the start of the World Cup I was getting ready to block out time to spend with Dad and made sure we had discussed which games we were going to see and where. I even went as far as take my sick days just for this occasion and my wife without hesitation did the same. This was going to be epic! My father was so happy to have Kaitlyn take part in this tradition as there was someone new he could share his knowledge about soccer with again, as he did with me when I was a kid. So every game we could that year we would wake up early and head over to my parents house and as we pulled into the drive way you could smell the delicious food my mother was already preparing for us. You could hear my fathers loud joyful voice and you could not help but get excited that finally, finally the time was here.. World Cup. Dad and Mom after a long weekend of World Cup Games. We spent that World Cup at my parents house eating, laughing, yelling, learning and most of all spending time with my father. I remember listening to him tell the stories of his career playing soccer to Kaitlyn and the joy I felt as I heard those stories being shared with her and how it took me back to being a kid hearing them for the first time. He absolutely adored Kaitlyn and having her be part of this tradition filled my heart in ways I cannot being to explain. As the weeks went by we filled our bellies and hearts with the food and the warmth my parents are so good at creating in their home. Finally, it got to the final game and there was a bittersweetness in the air, we knew that it was over but also knew that we had something so amazing to look forward to. We watched that game with great joy and savored every single minute of the game. When it got to overage time, we were all disappointed on how little there was of overage time, almost like we didn't want this moment to end. Nonetheless the game ended and we all talked about how excited we were for the next World Cup in 2018. Four years is a long time to wait but oh so worth it. I remember my father saying, "It will be here before we know it, Willie"
My father and I before he went into hospice. Well, Its finally here. But the difference is that my father lost his battle to cancer on the morning of April 29th. It will be much different this year. There will be no learning of mans history with sport again, nor will we hear his giant laughter as we pull up to the house. There will be no going over to my parent's house. In all honesty I have dreaded the days leading up to Thursday's start of the World Cup, but I am holding on to the joy he brought my wife and I during the last World Cup. So I will watch with a heavy heart but I will remember all the stories he told me. All the joy he felt watching these games with me. This is not just a game for us. It is a cultural event. And for me, it is the foundation where my relationship with my father started and ended. It has been the one constant in my life. I always knew without a doubt that every four years I would spend a month in the Summer with Dad and would laugh and feel his joy no matter what was happening around us. During his final days, I found a jersey he had given me of the El Salvador national team and we put it on him. He loved it. That was one of the last times he smiled. 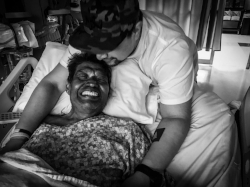 The night before he went into hospice I had a long conversation with him alone. I thanked him for teaching me so much, and I told him I would miss him this World Cup. "I will be there with you and Kaitlyn" he said. He looked at Kaitlyn and me and told me "You won the lottery with her, Will. I love her." I asked him if he was scared and he said no with a smile. I asked him how I could become a better man and he said "Take it a day at a time and be patience with yourself and the people you love." And that is what my Father and the World Cup have taught me. I miss you Dad and will be cheering loudly with you starting Thursday.